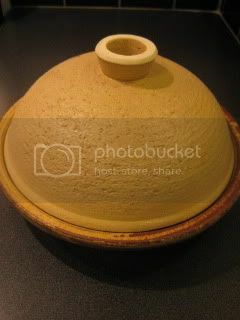 HAPPY DONABE LIFE - Mrs. Donabe's Rustic Japanese Kitchen: Donabe Steam-roasted Oregano Chicken...microwave cooking! Donabe Steam-roasted Oregano Chicken...microwave cooking! I had never imagined myself enjoying cooking with microwave...until I met this brilliant microwavable donabe steam-roaster, TOCHINSAI. With the effect of the heating grate (which can heat up to 600F in microwave) and porous Iga clay (great heat-retention and moisture absorbency which creates steam when the lid is pre-soaked in water), this donabe can cook ingredients to the best potential in microwave. The other night, I made super-eacy oregano chicken with avocado dip. 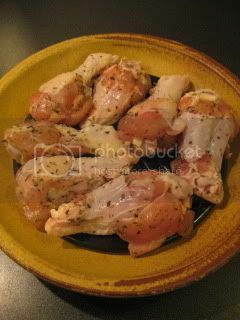 I seasoned chicken drummettes with salt, pepper, and dry oregano. The drumettes were set in the pre-heated TOCHINSAI (so the heating grate is already extremely hot) and cooked in microwave for about 6 minutes. After taking TOCHINSAI out of the microwave, I let it set (there is a lot of carry-over heat because of remarkable heat-retention of donabe) for a few minutes. While the chicken was cooking, I made quick avocado dip in 3 minutes. That's it! The aroma was so nice and chicken was cooked perfectly juicy. You can find the recipe at toiro's website.